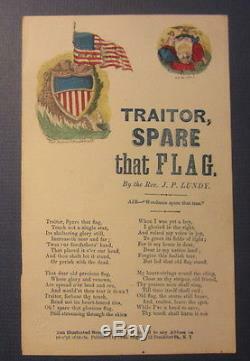 Original Old 1860's Civil War Era MAGNUS SONG SHEET - Traitor Spare That Flag. SIZE: Measures about 5" x 8". 100% Guaranteed old and authentic. The item "Original Old 1860's Civil War Era MAGNUS SONG SHEET Traitor Spare That Flag" is in sale since Wednesday, December 14, 2016. This item is in the category "Collectibles\Militaria\Civil War (1861-65)\Original Period Items\Other Civil War Original Items". The seller is "tmorris2" and is located in Half Moon Bay, California. This item can be shipped worldwide.